Swayambhunath Stupa is a divine place from where you not only receives good vibes but also experience the panoramic view of Kathmandu valley. Actually this is the nearest place inside the ring road which offers you an opportunity to enjoy the beauty of the nature as well as the scenic landscape of the valley. It’s also called Monkey Temple because of being a lot of monkey roaming around almost everywhere you look. You shouldn’t be surprised if you see more monkeys than visitors in the area of temple. The temple is located to the west of the Kathmandu valley. Swayambhunath means the ‘self-existent’ and ‘self-created’. The mythology behind its name is most popular than anything else in inception of Kathmandu valley. Once upon a time in Kathmandu valley was a lake. Middle of the lake was a lotus. Manjushree, a bodhisattva, with the vision of the lotus arrived into this valley. He wanted to have access of all the pilgrims to the lotus which was in the middle of the lake. That’s why he cut the gorge to pass the water away. After draining the water, the valley became habitat for the people. The lotus became a hill and the flower changed into Swayambhunath stupa. The history of Swayambhnath stupa dates back to Lichhavi period. In spite of the stone inscription found in the temple gives evidence of its existence since 5th century, it is also said that Ashoka in the 3rd century visited erected the temple in this place. However, the temple later was destroyed. The homage of Hindu kings and followers since the recorded time of King Pratap Malla to this date reflects the interrelationship and harmony between the Hinduism and Buddhism. The existence of the temple named Harati Temple, the deity of smallpox in the precinct of Swayambhunath Temple represents the equal reverence paid by the both religious people. In Buddhism, Swayambhunath places the second most worshipped God after Buddhism. 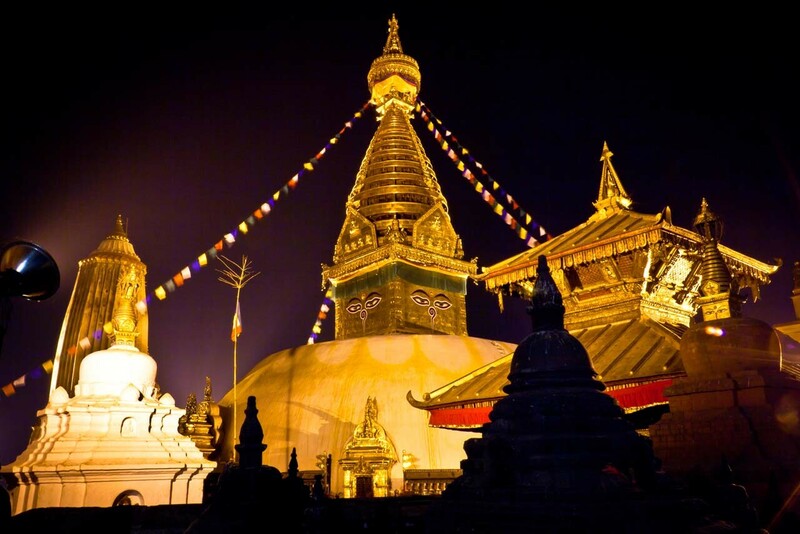 The most important attraction of Swayambhunath is Swayambhunath Stupa which beams on the top of the hill. The golden pinnacle positioned on the top of the stupa glimmers and beautifies the surrounding. The white dome below the golden peak resembles the stupa of Bouddhanath even though both have striking differences still having many similarities. Numerous small temples, stupas and chaityas magnifies the arena of the temple even powerfully. Once you reach at the top of the temple, you would get engrossed by the scenic landscape seen from there. In addition to its offering of mesmerizing view of the valley, the architectural richness of the Swayambhunath stupa allures indeed. The thirteen tier are constructed on the top part of the stupa. The thirteen tiers is ornamented by the placement of Gajur on the top. The thirteen tiers represent the thirteen step to be passed before reaching the reverend stage of nirvana. In four direction, you will see the Buddha’s eyes looking in every four directions above the dome. The two eyes have a connotation of wisdom and compassion. The one eye placed above each pair of eyes is the third eye which is believed to be the eyes which emanates the healing light to the world. You may be wondering how to enter into such a historical as well as religious place. The very popular way is from the west of the temple arena beside the ring road. When you enter from the west gate you see the magnanimous idol of Buddha and two other Buddhist deities which entices you. The golden plated statues glitter to make the surrounding vibrant with the aura of Buddha. You can feel the energy at this very place when you try to manage yourself in calm and balanced state of mind. However, don’t get bother if you get distracted by the teasing presence of monkey of the chattering voices of people around you. Above, this is the place allowed to visit of every kind regardless of their religion and creed. Enjoy the moment and observe the beauty around than being derailed by the thing which makes you bored. You will visit the place to enjoy ultimately. The next way is from the east ascending the 365 steps to reach the temple. If you want even faster and easier way to reach the temple. You can get on a taxi from the south of the temple. Even though you wouldn’t reach at the top on the taxi, you would be left very near on the bottom of the gate. Beside the famous temple named Swayambhunath, on the other top of the hill is situated a Shanti Mandir. The area is also called Shantipur. Regardless of its less popularity, the places weigh its value for having the abode of tantric master since 8th century who is believed to have lived many centuries and had the control of weather. This area is more covered by the jungle. The two third of the area of Swayambhu has been covered by the green and tall trees of pines, along with trees of different species. UNESCO included Swayambhunath in World Heritage Site in 1979 AD. The tremor of earthquake left considerable amount of damage in the site. In spite of its effect by the earthquake, the magnitude and magnificence of this sacred and soul-inspiring place places high.